Complaining about the weather never gets old to me. I love to hate on the frigid temps. It's almost as if there's some sort of camaraderie around the madness that ensues when it goes below 30 degrees. But you know what does get old? Dealing with dry, winter skin. Dehydrated skin turns into cakey makeup which turns into a not-so-ideal situation when trying to live your best life. And here's the thing no one tells you - skincare is not a one-size-fits-all scenario. I have unique skincare needs, and I need a powerful product that addresses exactly what my issues are. Then there's the problem of, well, WHICH skincare is right for me? This always adds a level of stress for me...but thanks to Clarins, they've set up this great quiz to help you determine which products make the most sense for your unique skincare routine. I took the quiz and it recommended the Clarins Double Serum, which helps with dullness (something I am always trying to overcompensate for) and signs of aging (oh the joys of laugh lines!) It also boasts evening skin tone and tightening pores. It has Turmeric which is essentially a super food known to protect and restore skin. It's also packed with ingredients like avocado, green banana, mango tree and goji berry. Serums make a huge difference when it comes to skincare. Not only do they penetrate deeper than moisturizers, but they also make your entire skincare routine work more effectively for you. For the past month, I've been using this every morning and night after cleansing my skin. 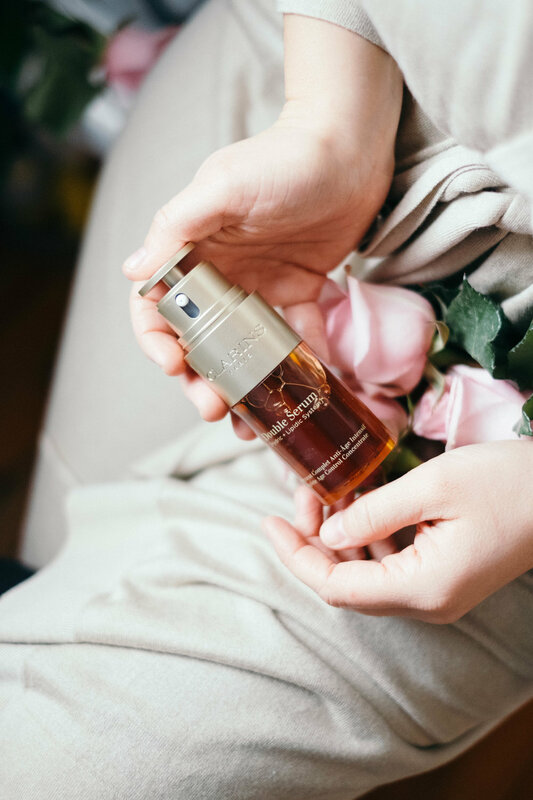 I've been using the Clarins Double Serum, but be sure to take this quiz to find the perfect serum for your skin. And as always, if you have any questions about the product, message me and I'll be glad to help! This post was done in partnership with Clarins and all opinions are my own.